A music critic at a classy publication recently subjected himself to several dozen hours playing Guitar Hero and Rock Band and now recognizes the insidious influence they might have on the youth of America. 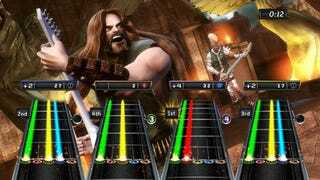 For another thing—and this is the main failing of music games, and it is a significant one—they have the insidious effect of glorifying classic rock, a music with an already bloated reputation that is founded on its very bloatedness. In the games' absorption with technical prowess, speed, flash, grandiose show, and fakery, they not only affirm the enduring allure of classic rock to kids and young adults, especially males; they also advance its tyranny. People like me who have kids of video-game-playing age no doubt get many things wrong about these games, and chief among the errors of our age group, I think, is inflated generational pride in the 1970s-style arena rock that Guitar Hero and Rock Band promote to our descendants—kids who might otherwise, and perhaps more appropriately, use their after-school hours to nurture interests in music of their own. The games reassure us that our aftercomers are our heirs. They are male-oriented tools of cultural primogeniture, applications of twenty-first-century technology with a very ancient mission. The full article will appear in the magazine's December 2 issue.